Today is #7 – Nine things you just can’t handle! feel terrible if I am running late. I think the exception to this is if you have a baby or small children …then you are kind of ALWAYS going to be late even if you have the best intentions! in no order is annoying the hell out of me. 5. My husband COUGHING all night. Just…take the medicine!!! Currently we’re a sick household, last night little man and big man were coughing all night. As the man says, Angus has ‘little man flu’. 7. Science fiction. Except Back to the Future which I hadn’t seen until I met the man. 8. Being called Jenny or worse Jenni. 9. 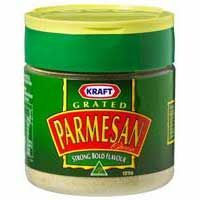 Kraft (fake) parmesan cheese – the smell. Ugh. This entry was posted in 50 things to post about, Uncategorized. Bookmark the permalink.